The deadline to pre-register for the STSA 62nd Annual Meeting is tomorrow, Tuesday, October 13. After tomorrow, registration fees will increase and attendees must register for the meeting and social activities on-site. 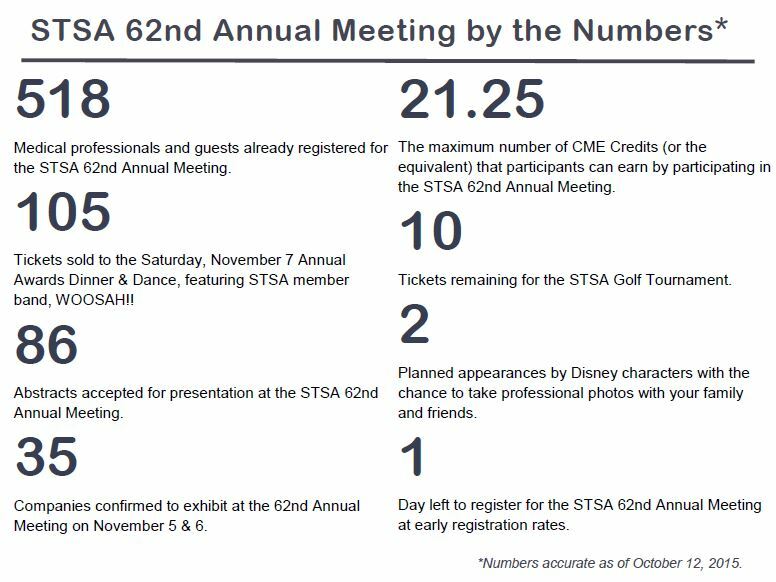 The STSA 62nd Annual Meeting will take place November 4-7 at Disney’s Yacht & Beach Club Resorts in Lake Buena Vista, FL. Register for the meeting online. Download a printable registration form. Visit www.stsa.org/62ndannual to review the 62nd Annual Meeting educational program. Here you’ll also find instructions to secure a hotel room in Orlando at reduced group rates. When registering for the 62nd Annual Meeting, be sure to secure your tickets to STSA social activities, such as the golf tournament, fishing tournament, and Saturday evening Awards Dinner & Dance. Learn more about social activities scheduled for STSA 62nd Annual Meeting attendees. Make your plans now to join STSA in Walt Disney World® for one of the most exciting CT surgery educational events of the year! Contact STSA Headquarters with questions at stsa@stsa.org or 800.685.7872.